​The one-stop shop for fly fishing and sporting goods retailers and ​the enthusiasts they serve. Welcome to our temporary site. Our new B2B web store is in the works and will be live in 2018. Qualifying retailers please e-mail dealers@rayrumpf.com for our new 2018 electronic order form. To view our available item list click here. Our 2016 catalog is available for viewing on our ​catalog page! 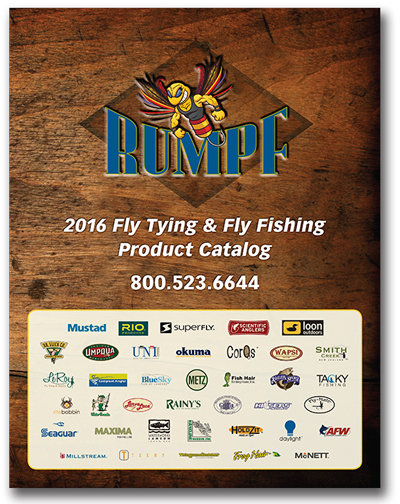 Please e-mail dealers@rayrumpf.com to receive the password to view the page. Supplying popular brands such as Bestway Outdoor, Daiichi, Tiemco, Gehrke USA, Hareline Dubbin, Griffin Enterprises, Anvil Vises, Loon Outdoors, Rio, The Bug Shop, O. Mustad & Son Americas, Scientific Anglers, Uni Products, J.G. Cote Inc., Dr. Slick, Superfly International, and more.